At Southern States Machinery, we live and breathe fabrication technology. That’s why businesses who process metal to make parts and products turn to us when they need new equipment. We have over 15 years of experience working with manufacturers large and small, and we can specify, design, procure and install the perfect machine for just about any application. Read on the learn a little more about us, and contact us today to ask a question or request a quote on machinery for your business. We don’t represent every line of fabrication equipment out there, we only represent the lines we believe in. That means you can trust us to provide machinery that will work correctly, run consistently over the long term, and help your business increase productivity and efficiency. Our team is fast and responsive. Whether you’re looking for specs, data sheets, dimensions, or something else, we pride ourselves on providing a high level of customer service day in and day out. The software you choose to run your business can be just as important as the machinery you install. With the right CAD/CAM, productivity or nesting software, your business can increase speed, reduce costly scrap, and maximize production. Our team knows software and can help you identify areas for process and design improvement that the right software implementation can help with. 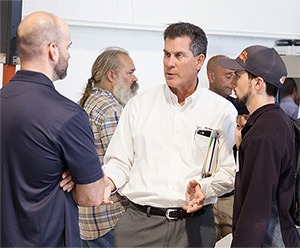 We offer a variety of seminars, factory tours, lunch n’ learns and networking events where you’ll learn the in’s and out’s of competing in todays global marketplace. 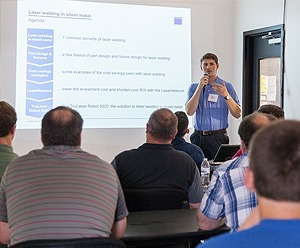 From classes on sheet metal design, to the latest insights on Industry 4.0, we host events that will help your business stay competitive and maximize results. Our service team is factory-certified on a wide range of machinery, and whether we have sold you a machine or not, our service department can help keep your fabrication shop in good working order. In addition to emergency repairs, installation, training and calibration, we offer application engineering. This service can help you solve complex manufacturing and design challenges to ensure that your business is running as efficiently and productively as possible. We saved the best for last… we may be biased, but our team is a top-notch group of friendly pros. So whether you have a simple question or a complex manufacturing challenge, we’re here to help! Give us a call, stop by and see us, send us an email, and simply reach out and say “Hi.” We love to help our customers solve problems and implement solutions, so we look forward to hearing from you!